On January 25th of this year the Greek left party SYRIZA won the elections and formed a coalition government with a minority populist right party, ANEL, to oust the previous center-right/center-left coalition (New Democracy/PASOK) that governed Greece during the first period of the Greek crisis. New Democracy and PASOK had been alternating in power at least for the last forty years. Syriza’s victory has been interpreted by a number of people on the left as a momentous change in the history of Greece and Europe, and has created inspiration and hope for radical change. Now that 100 days have passed with the “first Left” European government in power we are in a position to reflect and extract some lessons for the future. Since the beginning of the crisis in 2009, the Greek economy has undergone a brutal collapse, as attested by a cumulative GDP decline of 28% over a period of five years, and a public debt rise from 113% to 175% of the GDP. As a result of this collapse, unemployment increased to 26% (with one in two young people without a job) and a number of phenomena relatively unknown to our generation and foreign to the close-knit Greek society appeared in the cities, including infant mortality and suicide increase, soup kitchens, homelessness, and a large percentage of the population seeking primary health services through NGOs. The labor market was completely deregulated by abolishing collective bargaining, instituting lockouts, and practically denying the right to strike with 95% of strikes declared illegal by the courts. Finally, the government operated in a mode where passing fast-track laws and issuing executive decrees was the norm, thus ridiculing the so-called parliamentary democratic process. measures that aim at enhancing transparency and democratic participation, such as citizen’s legislative initiatives, curtailment of parliamentary immunity, and reregulating the mass media landscape that has been the territory of the Greek oligarchy. Greek crowds celebrate the Syriza victory. The first couple of weeks in February were full of symbolic and substantial moves by the new elected government. The ousting of the “troika” (consisting of the EU, ECB, and IMF) technocrats from Greece, and the numerous visits of the finance minister and the prime minister to European capitals to meet with their peers, publicize the new program, and gain political support, created an atmosphere of hope. A number of Greeks felt that they regained the dignity they had lost in the previous four or so years of continuous economic and political violence by the domestic and foreign elites. People who didn’t even vote for SYRIZA went to the streets in our generation’s first ever rally in support of the government. Even the relatively conservative establishment in the US expressed support to the anti-austerity policies that SYRIZA promoted, as evidenced by the numerous articles by New York Times and Wall Street Journal pundits. Yet, as time went by, it became more and more evident that the pre-election agenda could not materialize. Negotiations upon negotiations lead to the February 20th bridging agreement by which the government essentially agreed to pause the execution of its program in order to gain time and the needed liquidity. Under the immense pressure of the troika, the government was forced to (1) agree on budget surpluses (although lower than the previously agreed upon); (2) continue the privatization of the largest port (Pireaus), along with more than 16 tourist destination airports; (3) delay the minimum wage increase, as well as the repealing of a highly regressive real-estate tax; and even (4) scale down the humanitarian relief program. It goes without saying that the important issue of the debt write-off/restructuring has been taken out of the agenda for now and has been postponed for a new round of negotiations to happen in June. At the time of writing, another negotiation is taking place, with the “troika” seizing an opportunity to completely ridicule the left government by asking them to kneel and accept all of its terms or else. SYRIZA is facing a bitter existential dilemma and is reaching a dead end, as evidenced by the prime minister Alexis Tsipras’ recent talk about a referendum if the negotiations fail to produce a mutually agreeable result (without though specifying what this referendum will ask). Needless to say, besides the economic sphere, this government is expected to address a number of important issues, such as foreign policy matters and international relations (with Cyprus, Turkey, Israel, Russia, China, FYROM), the reformation of the penitentiary system, church and state relations, civil rights, corruption, and media oligarchs. With a few substantial exceptions, the SYRIZA-ANEL government has not taken action yet on most of these issues, which is to some extend understandable under the current situation. Observing this brutal assault of the transnational elite on the democratically elected government and the people of Greece, one need not be a radical to empathize with the Greek people, side with the SYRIZA-ANEL government, and hope that they will not cave to the ever-expanding demands of our European “partners”. On the other hand, it is our responsibility as radicals to assess with a clear head the tactical, and more importantly, the strategic mistakes of SYRIZA. It is of great importance to understand if the current predicament is not attributed to lack of experience and/or the other side’s irrational behavior, but is a direct consequence of SYRIZA’s overall political analysis. This painful exercise is essential for the citizens in countries of the European south, that are not (yet) in the position of Greece, and also for the citizens on the other side of the Atlantic, even in the comparatively prosperous USA, since by looking at Greece one may get a glimpse of their own future. It is now pretty much accepted by friends and foes of SYRIZA that the belief in the ability of the government to implement anti-austerity policies within the EU (let alone within the Eurozone (EZ)) is a pipe dream. This belief can only lead to continuous retreats with the only visible end an economy with labor force conditions akin to that of China. But why was SYRIZA unable to diagnose this accurately and timely? In our opinion, the reasons lie in the political analysis of SYRIZA leadership, which is shared by much of the European left. According to this analysis, neoliberalism is an ideology, one of the many possible manifestations of capitalism and it can thus be reversed within the EU if appropriate political parties come to power. The recent crisis, it is said, is the result of such neoliberal policies that were enacted by right-wing governments (with Thatcher and Reagan always listed as the villains) and greedy capitalists all over the world in the end of the 70s, thus ending the post-war social-democratic consensus. This analysis disregards a number of systemic components of capitalism, such as (a) that capital is always greedy—by necessity; (b) these policies have been consistently implemented by both center-right and center-left (social-democratic/liberal) governments over the last 30 years and cannot be attributed just to economically conservative politicians; (c) neoliberalism is a structural phenomenon that occurred in the 70s when the internationalized economy, dominated by the emergence of the transnational corporations and faced with declining profits and stagnation, became incompatible with the social-democratic consensus. The emerging globalized economy necessitated a different, more extroverted/competitive economic model in place of the model of production/consumption for the domestic market (this of course does not mean that such a change was unavoidable due to some kind of material law of History, but was a result of the objective and subjective conditions of that time). Consequently in today’s internationalized economy there cannot be any kind of capitalism other than a neoliberal one, and thus, any return to Keynesian/New Deal politics is impossible, since such policies require a strong nation state and relatively closed economies. To put it differently, capitalism will commit suicide if it accepts such policies. 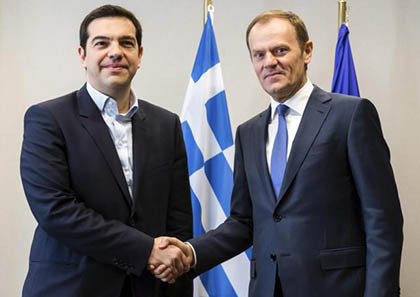 Greek Prime Minister Alexis Tsipras and European Council President Donald Tusk. It should not be surprising that once this idea of “neoliberalism as an option” is accepted, one can hope that EU (the main globalizing institution in Europe) can be transformed into a fairer, more equal, and more prosperous economic and political area, accountable to its citizens. Following this point of view the way forward is to push for technical solutions within the EZ, such as the issuing of Eurobonds by the ECB, or even the exit of the EZ in order for a country to gain monetary sovereignty. However, although the ability of a country to define its monetary policy is a necessary condition for sovereignty, it is by no means sufficient, since the freedom of movement of capital, goods, services, and labor is a founding principle of the EU (not just the EZ). Finally, another corollary of this analysis is that ostensibly the EU is the only acceptable arena for social struggle. In fact, any popular movement that defines itself as national is seen with suspicion by the left. This internationalist thesis deemphasizes the national liberation aspect of this struggle and leaves this space to be filled by ultra-right-wing political rhetoric. This way the left pushes away a large majority of newly pauperized low- and middle-class victims of the crisis, whose interests naturally align with the working class. These people, not being class aware, are guiding their anger and frustration towards the wrong targets, depriving at the same time the Left of a vibrant social ally. 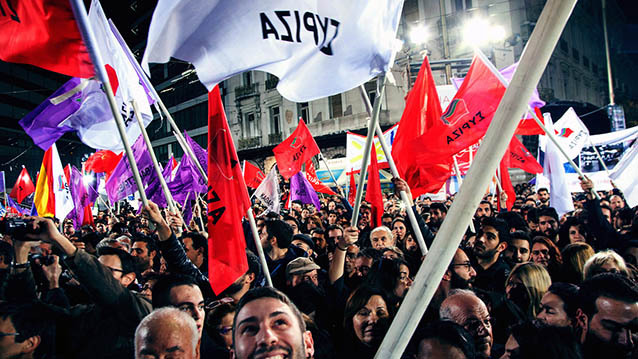 In our opinion the above-mentioned political analysis dictates the strategy of SYRIZA and has imprisoned the government in this dead end negotiation with its admittedly cynical “partners.” Therefore, the question emerges almost inevitably: what is a more realistic analysis that the Left should adopt so as to identify the problem, address–even partially–its causes, and empower people to create a way out of the crisis? The roots of the crisis lie in the very structure of the capitalist system. This is a structural, systemic problem. Capitalism promotes uneven development of world economies, according to the role assigned to each country based on its position in the world economic net. One need not be a proponent of dependency theory to agree with this observation. Today we experience globalized capitalism, and more specifically its fierce evolution to neoliberalism. Once a small economy like Greece is fully integrated in this globalized system, it has no other choice but to try to be competitive by adopting some of the most inhumane and socially destructive remedies: massive privatizations, fiscal austerity, deregulation, flexible labor markets, low wages, implementation of an extroverted production/consumption model, leading to the disruption of social cohesion and solidarity of any kind. Countries integrated in the globalized economy clearly have almost zero degrees of freedom. The more attached they are to globalizing institutions, the more distant the potential of escaping the grasp of neoliberalism becomes. In Europe, the dominant institution of global capitalism is no other than the EU. Therefore, it becomes crystal clear that, as explained above, in order to regain sovereignty, a country has to exit not only the EZ, if a member, but the EU itself. This exit, although not sufficient, is necessary for a country to pursue a different fate. The above analysis prescribes a possible viable solution to the Greek crisis: exit the EZ/EU, issue a national currency, and immediately impose unilateral debt write-off. Liberated from the noose of the EU treaties and regulations, Greek people will have the freedom to follow a sovereign monetary and fiscal policy and form trade and international alliances to the best of their interests. Pressured by the people, the government will be able to increase and reprioritize public spending so as to effectively and rapidly fight unemployment, to control capital movement and achieve redistribution of wealth through taxation, to enhance and reconstruct domestic production, to strengthen democracy, transparency, and social control of all aspects of public life. It should be clear that such a solution does not even remotely constitute an end of the social struggle towards a fair and equitable democratic society (such a teleology is in any case foreign to democracy). However, given the realities of the devastated Greek economy and society, this solution may provide a fruitful beginning. It is, for sure, a steep path to follow. Nevertheless, it is more immediate than a generalized social revolution (which part of the radical left sees as a prerequisite for change), which would require vastly different objective and subjective conditions. At the same time, it is not a reformist approach, as it identifies the core of the problem, which is the globalized neoliberal capitalist system, and aims for direct, substantial changes outside this system. This transition strategy will initiate and cultivate a public discussion, engage and educate the people, and encourage them to think outside the asphyxiating systemic box, while at the same time improving their material conditions (at least in the long run). This is not a suggestion for an instructional or patronizing left; it is a suggestion for a left that demolishes all taboos and inflexibilities, inspiring and unifying people in this crucial crossroad. Building a massive and unified popular front is admittedly not easy. Extra-parliamentary radical left groups in Greece have a hard time agreeing on how to form such a social front so as to gather as much support as possible around them and fight to win this battle. Apart from the economic and political elite, which obviously is not the target group of this collective attempt, there is no consensus as to who should be included in this front. Is this going to be an anti-capitalist front, one of the radical left, or one of national liberation? Should it expand beyond the traditional limits of the left? What should it fight for and what should it focus on? These questions are not easy to answer, but they reveal several of today’s challenges that radical leftists in Europe and elsewhere have to face and answer. The obstacles that SYRIZA is facing and the contradictions of its analysis should not discourage working class people from fighting their way to transform society. It is however of crucial importance, now more than ever, to identify which is the battlefield, who are the allies, and who is the enemy. Dead ends should make us reflect and seek ways out. The bulldozer of neoliberal capitalism can be eliminated and give way to an inclusively democratic, just, and equitable society. Solidarity to Greek people who fight for hope! Solidarity to all people who fight for freedom and social justice against all authority! Achilleas and Eleni are Greek socialists and activists, friends of Solidarity, currently residing in the U.S. They wrote this article for the Future of the Left/Independent Politics Conference held in Chicago on May 2-3, which they were unable to attend. They invite comments. Dear friends, and dear Achilleas and Eleni. The part of your analysis particularly on the nature of today’s globalization based on the open and liberated markets and the advancement of transnational corporations is spot-on. Capitalist globalization can only be neoliberal! This is what the EU serves in its core and cant be changed from within, nor can we wait until all working people in the eu understand this before exiting the EU, Unilaterally. Takis Fotopoulos and Inclusive Democracy have long strived for directing social struggle in each country, particularly of the south, towards an exit from the eu and breaking all ties with neoliberal globalization, by creating self-reliant economies, as a first step for a new democratic/socialist world order. Fotopoulos has painstakingly sketched a transitional program particularly for the greek people and all peoples under economic occupation in the South, called ‘A popular front for social AND national liberation’. Here is his analytical thesis and proposal. We are a group of people fighting towards this direction in Greece which is getting more imperative than ever now, with syriza showing its true colors!. Join us in this difficult struggle! So…a practical question for Achilles, Eleni and anyone else interested. The Syriza government has demanded that municipalities and social welfare administrations (hospitals, sanitation, etc) transfer their cash reserves to the national government. The first request preceded the delay to recent euro 300 million payment due the IMF. The Syriza government has maintained its commitment to servicing the debt. This second request (since the first one was more or less ignored) has the Interior Minister threatening punitive action against municipalities and services that do not comply. So should workers organizations, unions, radicals, socialists, endorse Syriza’s demand for cash to be forward to its accounts; or should workers, unions, radicals, socialists oppose the Syriza government’s demand and counterpose the demand that the government repudiate the debt in its entirety?